Matt Riddle appeared for the first time at an NXT event when he appeared NXT Takeover Brooklyn but is yet to make his NXT debut. In coming to the NXT, Riddle now has the potential for several dream matches that could occur both at NXT and in the main roster. However, as Riddle has yet to make even his televised debut for NXT since signing, we take a look at the five people Riddle could ideally line up as his first target. 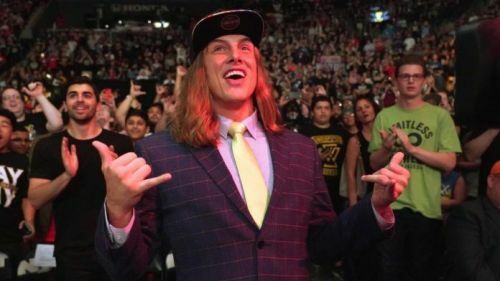 Whether it be wrestlers he faced on the indy scene, a clash of styles or big-name against big-name bouts, this list is the top 5 dream debut opponents for the "King of Bro's" Matt Riddle. The Velveteen Dream should be on every new signee's list of dream opponents. The charismatic enigma seems to established himself as something of a welcome mat for the high profile indie signings that are brought in to NXT as of late. The Dream has shown he has what it takes to match it with a variety of styles, given his fantastic matches against the smaller Leo Rush, and Ricochet to his battles against the likes of Aleister Black and Kassius Ohno. While Dream is currently set to face Johnny Gargano on next week's episode of NXT, a program with Matt Riddle to start him off could be amazing. Just think of what Dream could make of the former UFC stars penchant for weed and chops, and just what that may lead to. From Riddle's end, the Velveteen Dream is one of the few on this list that he wouldn't have been able to face on the independent scene.